Vehicle collisions can often do damages that are not visible to drivers. The effects may not be felt until weeks later on the road. After any collision or collision repair, drivers should receive a complete vehicle examination. With the trained eyes of the professional auto body techs at Scott’s Body Shop, you can avoid unsafe driving and costly repairs down the road. Your vehicle’s suspension may have been compromised as a result of the collision. Our team will identify this immediately upon inspection and fix it for you. Automobile collisions can do damage that you don’t immediately recognize, and then once you do, you need to know the best place to go for services. 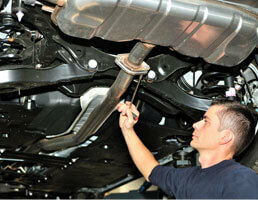 Vehicle suspension repair is one of our specialties. We’re able to restore optimal performance after any major impact. When you come to us first, we get you back on the road to recovery faster. Our preventive examination measures ensure safety for you and your passengers. Normal wear and tear will eventually damage your vehicle’s suspension, but a vehicle collision can do so immediately. While you are getting all the cosmetic repairs done for your car, make sure you are getting an accurate and complete damage analysis. Scott’s Body Shop will make your vehicle is aesthetically pleasing like it was when you first bought it. We will also diagnose any structural or mechanical repairs that need to be fixed as a result of the collision. For optimal driving performance, we’ll perform your vehicle’s suspension repair. We won’t let you drive away wondering for the next month about what’s wrong with your vehicle. If something doesn’t seem right with your vehicle’s suspension after a collision, just bring it to us. Our team will have you driving safely and handling corners correctly in no time. Schedule Your Suspension Repair Today! Give us a call today to schedule your auto body service appointment. Scott’s Body Shop is your best option for suspension repair in Big Rapids, MI. Our team knows the best after-collision care for your vehicle. With a complete examination and an accurate damage analysis we’re able to identify all structural and mechanical damages, including suspension repairs.